PRICE: 1200 yen SRP when new. Currently available on e-paid in Europe for $65-120.00 plus shipping. 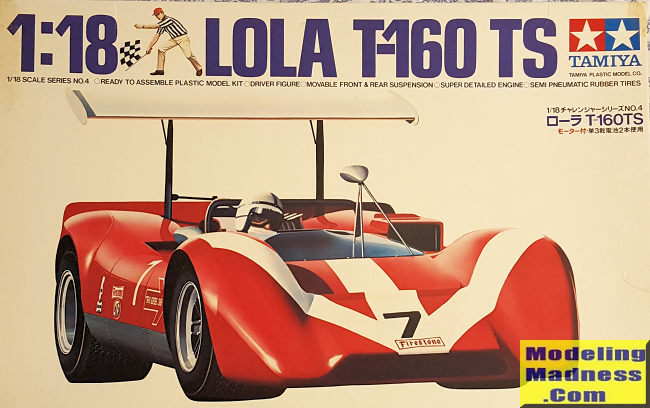 The Lola T-160 was first introduced to the public in early 1968. Essentially, this was a rebodied T70, a car that had been very successful in the first year of the Can-Am Challenge in 1966, but had started showing its age. The latest version for Group 7 racing, had styling that reflected a new trend in aerodynamics: a much more angular body with a downward sloping nose and a pronounced spoiler. This downward sloping nose design was also present on T70 Mk 3B , but not to such a degree. Dan Gurney, James Garner and Jerry Hansen were set to get the first T-160s for the fall Can-Am series. Since Lola basically built customer cars, there was a great deal of interest. In total, 12 were manufactured before production switched over to a newer vehicle. Rarely were cars raced as bought. It was not unusual for teams to make changes to the baseline car, especially as the season progressed and deficiencies were discovered. One of the more interesting teams (and no T-160 ever won a Can-Am race) was that run by driver John Surtees, who won the 1966 championship driving a Lola T-70. This was the time of wings on cars and until banned in 1969 after the Monaco GP, they were used in pretty much every type of racing. These wings, high in the air, produced downforce directly on the rear suspension members. This, in turn pushed down on the back of the car providing increased traction, especially through corners. Repeated failures of the struts holding these wings caused some rather large crashes and so high wings were banned by the world governing body. Originally the T-160 came without these wings and was raced in a slightly modified form in 1969 without them. It was in 1969 that the T-160 got its highest finish, a 2nd place. Surtees' car had an additional oil cooler on the left rear fender. He never finished in the points while driving this car. I am not really sure which boxing this one is, but suspect it may well be the first. Unlike some other boxes I've seen, this one touts pneumatic tires vice hard rubber. It also comes with a metal gear box with motor, wiring and a switch. 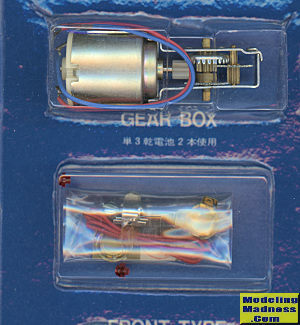 Usually only the very early Tamiya large scale car kits come with the motor. I bought this one from a hobby shop in the early 1980s. He had it in the back room with a number of other very old kits and I paid $14.95 for it. It was still in the shrink wrap with the usual MRC stickers over the Japanese price tag. I removed the shrink wrap just today before sitting down to do this article. All of the body parts are molded in red plastic. There is a plated sprue for some engine parts and brake discs as well as several grey sprues for some of the wheels, the rest of the engine and the intake/exhaust. A black sprue contains the other two wheels and most of the interior parts. A blue tinted clear piece is provided for the windscreen. This latter piece has managed to acquire some gouges in it over the years. Not surprisingly, one encases the gearbox and electric motor with the engine and transmission. This is followed by the exhaust and accessories. One will need to do detail painting prior to assembly on a lot of these parts. The engine itself is not wired. The wire in the kit is used to build up the electrical circuit for the motor. This will eventually take a pair of AA batteries. The access to these is on the underside of the tub in what would be the fuel cells on the real car. Once the engine is installed, then the rear suspension bits can be added, the cockpit built up and the frong suspension and radiators installed. The kit comes with a driver's figure and un less you have access to a 1/18th 60's racing harness, it would be a good idea to install the driver. 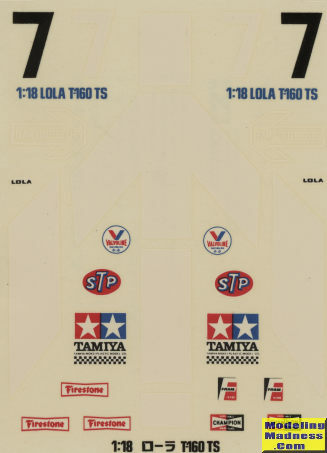 This was one of the first uses of full face helmets and Tamiya provides a template for the visor area, which you make from a section of clear acetate. However, Surtees did not use a full face helmet when driving this car so the builder is left with a bit of a conundrum. With the driver and lower bodywork done, the rest is the installation of the upper works, wing and tall mirror. Instructions are vintage Tamiya with Tamiya/Pactra paint references. There are many detail drawings as well as a written step by step assembly guide on the sides of each page. Team Surtees was red with a white arrow on the front of the car. The lower side panels are unpainted aluminum and the wing is white. Wheels are also unpainted aluminum with polished rims. In addition to the motor, the car does have steerable front wheels. Decals are mostly white, which is why you cannot see much in the image. You will be glad to know that IndyCals makes a replacement set so you don't have to use the nearly 50 year old decals (assuming this is the 1968 boxing: there was another boxing in 1974 and again in 1995 according to Scalemates). A couple of years back, Tamiya reissued their McLaren M8A kit in this scale, though without the motorizing equipment. Perhaps they will do the same for their other 1/18 Sports Racers. The selection is really quite small, but if you are a fan, and you like larger scales, then you should perhaps seek out this and others in the series. Various web pages including Wikipedia for the Can-Am race results.